Grasslands are home to unique flora and fuana throughout the Neotropics. See below to learn more about the areas we target for our funding efforts. The strict definition of the Neotropics is the region in the New World between the tropical latitudes (23.5 degrees). For our purposes, we define “Neotropical” as the biogeographical region of Central and South America. Neotropical grasslands cover a range of habitat types and regions. From permanently flooded wetlands to cyclically dry and flooded savannas, these regions support rich diversity of plants and animals. The map on the left indicates ecosystems that fall into our funding purview. See below for definitions of grassland types. Savannas are open areas where grasses dominate and where seasonal droughts and frequent fires are normal ecological occurrences. Savannas may include trees and shrubs, but not in a continuous cover. Savannas cover about 45% of South America. Wetlands are similar to savannas but don’t have fires or dry seasons. They are dominated by grasses other than those in the families Graminae and Cyperaceae. Caatinga are areas of dry shrub lands in northeast Brazil and extend over 800,000 square kilometers. They have virtually no grass substrate and more dry season moisture availability. Caatinga do not qualify as cerrado as these areas have virtually no grass substrate. Cerrado are Brazilian savannas. There is a wide range in the density of trees over the savannas, especially in the well-drained savannas; these range from pure grasslands to virtual forests. Chaco are areas of thorn scrub. They extend from northern Argentina to southern Bolivia and across to Paraguay. Espinal are dry woodlands bordering open grasslands. Gallery Forests are vegetation bordering streams and rivers. Comparable to riparian habitat in North America. Llanos are seasonally inundated grasslands and wetlands in Venezuela, Colombia, and Bolivia. Comparable to the Pantanal. Monte are shrub steppes and light woodlands. 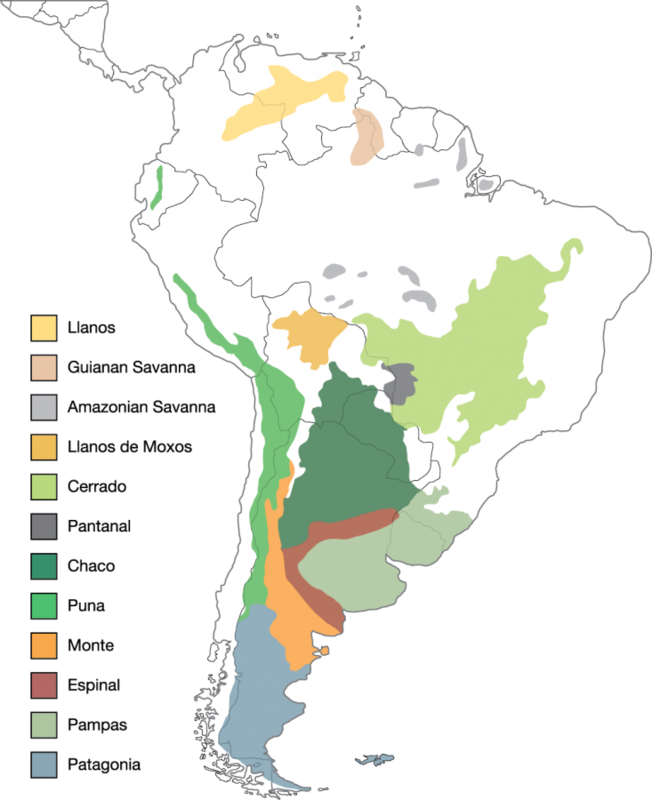 Pampas are temperate grasslands in Argentina, Uruguay, and Paraguay covering some 777,000 square kilometers. Pantanal: area of seasonally inundated grasslands and wetlands in Brazil and along the Parana-Paraguay river system. These areas are comparable to llanos. Puna: high elevation grasslands and moors of the Andes. Regional savannas and wetlands are small patches of savanna woodlands within the Amazon basin that provide “stepping stones” between the Pantanal and the llanos.